Born: Charles Martin, 1918. Education: Studied engineering. Career: Writer and composer; couture house, Creations Jacques Esterel established, 1953, filed suit against Yves Saint Laurent, 1979; suit resolved in his favor, 1985. Died: 1974. "L'univers de Jacques Esterel," in Jardin des Arts (Paris) May/June 1973. "YSL is Fined for Being a Copycat," in the Chicago Tribune, 17 July 1985. 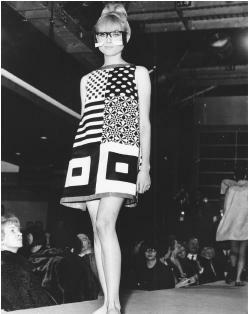 Jacques Esterel, 1966 collection: "Playtime 1," a beachshift ensemble with "Happy Glasses." well as a designer, writing several plays and songs for the guitar in addition to running his many boutiques in France and throughout Europe. He brought his theatrical side into his clothing design, creating amusing novelties and employing outrageous styles and props, so much so that many of his admirers and critics considered him more of a showman than a serious couturier. Esterel, whose real name was Charles Martin, was the son of a French industrialist and was originally educated as an engineer. He established his couture house, Jacques Esterel, in 1953. The first years were especially successful as Esterel contributed to a playful fashion spirit, illustrated by the "Vichy" bridal gown which he designed for French actress Brigitte Bardot. Esterel built up an international reputation for his couture house, traveling the world to promote his collections, even appearing behind the Iron Curtain when the Soviet Union was off-limits to Westerners. But Esterel always remained true to his love of the stage and his background as an engineer, claiming that the 72 patents he held on machine tools allowed him to support his fashion design career. There was something of the carnival performer in Esterel's attitude toward fashion. His designs were often extremely fanciful—and often ridiculed by the fashion press. It was as if couture for Esterel was more about exploring his own sense of whimsical creativity rather than about designing clothes. In 1963 his show included tweed hats with small black veils and umbrellas with built-in lights. Prior to the 1964 show he declared that several of his top models would appear with shaved heads "to give a new importance to a woman's face." His 1965 collection was called "confused and complicated," and included striped bathing suits with long skintight legs described as looking like "something out of a Mack Sennett movie." Esterel was not simply a jester at the court of fashion, however, he was often in the forefront of fashion trends in the 1960s and 1970s, taking au courant looks from stylish young "Mods and Rockers" on the streets and translating them into haute couture. His 1965 designs for men included a plaid suit with a kilt and a salmon-colored Nehru jacket in corduroy, worn over high yoked pants with zippers on front and back. For women he created dramatic evening wear, including an ensemble of overblouse, floor-length skirt and great hooded evening cape of matching velour. Esterel's lively intelligence saw no creative boundaries, whether he was designing a garment, writing a song, making his own store fixtures, or sharing his vision with other designers. In the early 1970s Esterel created his most well-known and talked-about collection, the "unisex" line, presenting clothes designed for both men and women. Ever the iconoclast, his first foray into the U.S. found him opening a couture shop in the New York suburbs, far from the fashion industry center in New York City. And the high-spirited, uninhibited house of Esterel attracted and fostered young talents, including future stars Anne Marie Beretta and Jean-Paul Gaultier. Jacques Esterel, 1966 collections: "Mironton" (left), a Scottish-style plaid kilt ensemble, and "False Brother" (right), a vinyl pantsuit with zipped jacket ensemble. in favor of the Esterels in 1985. Yves Saint Laurent, roundly considered the most respected house in Paris haute couture, was fined $11,000 and required to pay a $1,100 fine for every suit made from the plagarized Petit Marquis design. Because of the messy legal wranglings, Creations Jacques Esterel was dropped from the Fashion Creators Union and banned from showing collections as a grand couturier in Paris for several years.